Many businesses these days struggle to retain their employees — and especially the millennials who are now entering the workforce. Instead of just a stable paycheck, many now look for a bit more in their jobs, and the companies that can offer that are the ones that will keep their best employees for longer. Rallyteam, which is launching at TechCrunch Disrupt SF 2014 today, sees itself as an “employee empowerment platform.” The service helps employees find interesting internal opportunities on which to spend a few hours a week that will help them broaden their skill set and expand their horizon inside the company. Rallyteam’s Canadian co-founders Huan Ho and Dan Ellis came up with the idea for the service after working in large corporations for a long time. On the one had, these large corporations often offered few opportunities for growth and that the professional development opportunities they offered were mostly boring. But at the same time, they also noticed that many departments often resorted to outsourcing projects even though there were probably people in the organization that could have (and likely would have) been happy to spend some time learning about the problem and fixing it. Rallyteam tries to solve both of these problems by capturing the projects inside a company that have either been on the back burner for a while or that are about to be outsourced. The software then tries to match these projects with employees who have the right skill for them. Ideally, that gets the problem solved without having to spend money on outsourcing and gives employees an opportunity to work on something new for a few hours a week. When the system finds a match for a new project, it automatically notifies all of the employees who look like a possible match. Ho likened the service’s matching algorithm to eHarmony. Rallyteam looks at the project’s description and tries to figure out what kind of core skills it would take to complete it. Ho argues that many businesses already encourage their employees to spend a few hours a week on learning, but instead of just listening to an online lecture or clicking through an online course, Rallyteam will offer them experiential learning. Currently, there are a number of companies that are already running pilots with a number of large companies, including Orange, the University of San Francisco and Finland’s Business Kitchen entrepreneurship hub. Rallyteam is also working with The Global Summit to see how nonprofits (which it won’t charge for its service) can use its platform. 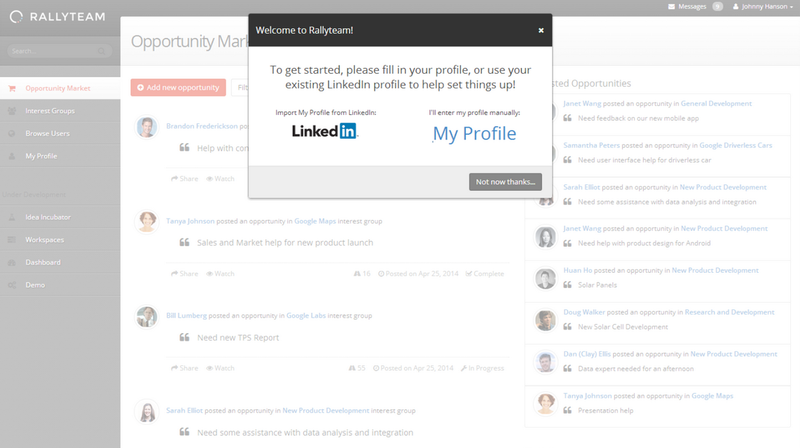 Rallyteam will use a standard SaaS business model with a pricing scheme. While the company wasn’t quite ready to disclose the actual price yet, Ho tells me that Rallyteam will charge companies a monthly subscription for every employee that’s part of the program. Starting today, the service is opening up its private beta, so if you want to give it a try in your organization just head over here [link coming] to sign up. Q: What are your margins? A: We will charge $1 to $5 per user. Q: Can you say something about your current users? A: We have a pilot program with Orange Telecom, a non-profit and we are working with a university. Q: How do you measure ROI? A: The ROI is set by the person who closes out the opportunity. Q: Why did you build for the web instead of mobile? A: It’s just two of us right now and we are not mobile developers. We also think that starting with the desktop in the enterprise makes sense. Q: The employee who is advertising that he or she has free hours could run into problems. What if you don’t want to advertise you have free time on the job? A: This is not free time. It’s professional development time.